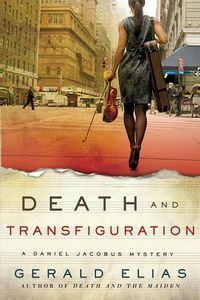 Death and Transfiguration by Gerald Elias: Synopsis and Online Purchase Options. Synopsis (from the publisher): Vaclav Herza, the last of a dying breed of great but tyrannical conductors, has been music director of Harmonium for forty years. The world famous touring orchestra was created for him when he fled Czechoslovakia for America during the political turmoil in Eastern Europe in 1956. It is the eve of the opening of a dramatic new concert hall designed by Herza himself. It is also the eleventh hour of intense contract negotiations with the musicians that have strained relations within the organization. When the acting concertmaster, Scheherazade O'Brien, is summarily dismissed by the despotic Herza for the permanent concertmaster position, an audition she was poised to win, O'Brien slits her wrists and the orchestra becomes convulsed. Now, blind, cantankerous violin teacher Daniel Jacobus, who had shunned O'Brien's earlier plea for help against Herza's relentless harassment, investigates Herza's dark past not only in Prague, but in Tokyo and New York. With the help of his old friends Nathaniel Williams, Max Furukawa, and Martin Lilburn, he seeks not only revenge but redemption from the guilt of his own past.